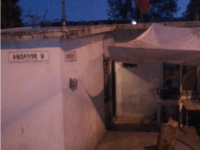 CIUDAD VICTORIA, Tamaulipas — Cartel gunmen murdered a two-year-old boy and his family in the most recent execution in a trend of violence without end. El Narco-terrorismo sigue creciendo cerca de la frontera con Texas donde los carteles Mexicanos que controlan la frontera entre Mexico y Estados Unidos esta usando videos de decapitaciones como ISIS para intimidar a sus rivales y para aterrorizar a los civiles a que se sometan. 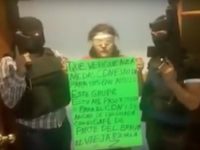 El Cártel de Los Zetas esta luchando por control de redituables corredores del trafico de drogas y de humanos hacia Texas. 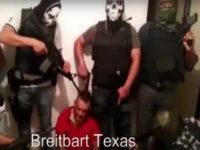 Breitbart Texas pudo obtener videos exclusivos del narco-terror de Los Zetas el cual puede ser visto en LiveLeak. 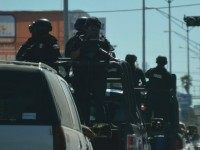 Narco-terrorism is thriving near Texas as one of the Mexican cartels controlling the U.S.-Mexico Border is resorting to ISIS-like beheading videos to intimidate rivals and to scare the civilian population into complete compliance. 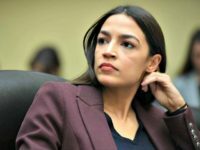 The cartel, Los Zetas, is fighting for control of lucrative border drug and illegal immigration corridors into Texas. 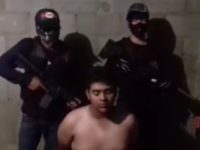 Breitbart Texas obtained exclusive video of Los Zetas’ narco-terror which can be viewed in full on LiveLeak. A key leader within the Los Zetas cartel was murdered inside the state prison in this city by members of a rival faction of the same cartel. That Zeta commander had been arrested this week in a house tied to the former State Security System. 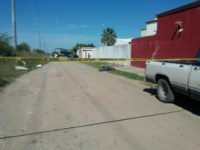 The Tamaulipas Government confirmed to Breitbart Texas that 37-year-old Jose Luis “Comandante Cano” Cano Lumbreras was murdered inside the prison. Cano was returning to his cell from a court hearing when he was attacked by a group of inmates and asphyxiated. 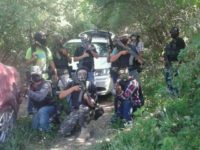 MONTERREY, Nuevo León — Mexican authorities have arrested one of the key leaders within the fearsome Mexican cartel known as Los Zetas. The man is considered one of the individuals largely responsible for the violence that has spread throughout northern Mexico. 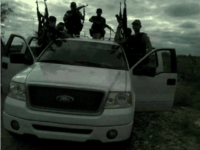 CIUDAD VICTORIA, TAMAULIPAS — Cartel gunmen with a of the faction of Los Zetas murdered four victims–including a teen and dog–as they continue a long-standing civil war for control of the city. 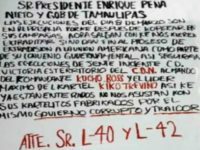 CIUDAD VICTORIA, Tamaulipas — A series of banners hung this week point to yet another split within the Los Zetas cartel and more violence as a result. MONTERREY, Nuevo Leon — While the government in this border state denies any alliances between drug cartels, the recently arrested leader of a hit squad confirmed ties with some members of the Los Zetas and Gulf Cartels in order to fight off their shared rivals. 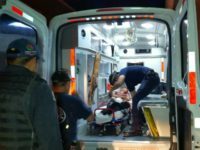 Authorities in this border city continue to look into the brazen attack where a team of Los Zetas gunmen shot a teenager in the face with a shotgun. The shooting victim survived the attack but lost both eyes. CIUDAD VICTORIA, Tamaulipas – La guerra que se lleva acabo por el control de territorios del tráfico de droga continúa esparciendo el terror en este estado fronterizo ya que las ejecuciones y tirar cuerpos continúa siendo común. 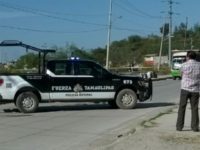 CIUDAD VICTORIA, Tamaulipas — The ongoing war for control of lucrative drug trafficking territories continues to spread terror in this border state as executions and dumped bodies are increasingly commonplace. 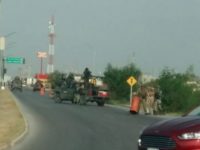 CIUDAD VICTORIA, Tamaulipas — Despite the recent arrests or killings of top cartel members from two rival factions of the Los Zetas, the violence has not decreased. 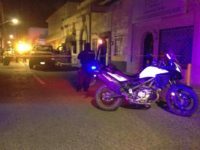 CIUDAD VICTORIA, Tamaulipas — La guerra que llevan acabo facciones rivales del Cartel de Los Zetas ha desatado una ola de violencia imparable la cual sigue dejando muerte y terror. Esta semana la violencia tuvo un repunte con un siete ejecuciones y una balacera que mato a seis mas todos en menos de 24 horas. 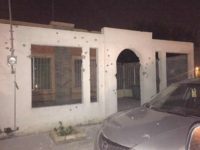 CIUDAD VICTORIA, Tamaulipas — The war between two rival factions of the Los Zetas Cartel has set off an unstoppable wave of violence that continues to spread death and terror. This week, the violence spiked with seven executions and a gun battle that killed six others in a span of less than 24 hours. CIUDAD VICTORIA, Tamaulipas — The recent capture of a regional Zeta boss after his own men turned him in, points to an escalation of violence in the various cities of this border state that have become the battleground for a civil war within the Los Zetas drug cartel. 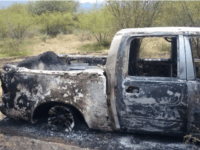 CIUDAD VICTORIA, Tamaulipas — The Mexican government has remained silent in the days after a group of cartel gunmen shot and incinerated three of their rivals. 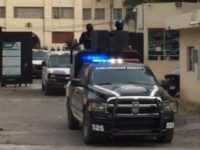 NUEVO LAREDO – La guerra civil dentro del cártel de Los Zetas ha resultado en la fragmentación de grupos dentro de las facciones rivales y en más asesinatos sólo a metros de la frontera de Texas. 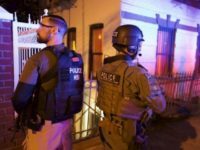 NUEVO LAREDO — The ongoing civil war within the Los Zetas drug cartel has resulted in the splintering of groups within the rival factions and more murders just yards from the Texas border. MONTERREY, Nuevo León – Autoridades mexicanas detuvieron a uno de los líderes dentro de la estructura del cártel de Los Zetas. La detención se produjo mientras la organización criminal lleva a cabo una terrible guerra civil que ha extendido la violencia de los cárteles por varios estados de la frontera.